The square jellyfish is a vivid description of the anatomical appearance of this kind of jellyfish which appears cuboidal in shape. Usually referred to as the box jellyfish belonging to the Cubozoa class and the number of species total to over 19. The best known square jellyfish is the Chironex fleckeri which holds the most toxic poison in the entire animal kingdom. The venom targets the cardio-respiratory system. The breathing muscles collapse and the stung person dies from suffocation, shock and from the pain which has been described as extremely overbearing. Statistically, the box jellyfish is the prime killer, ahead of all other animal dangers including sharks and the salty water crocodiles in the Australian region where they are found in abundance. Box jellyfish are camouflage experts. They are transparent pale blue, which makes them hardly noticeable in the water. That means that if one was to sting you, you would hardly see it coming. 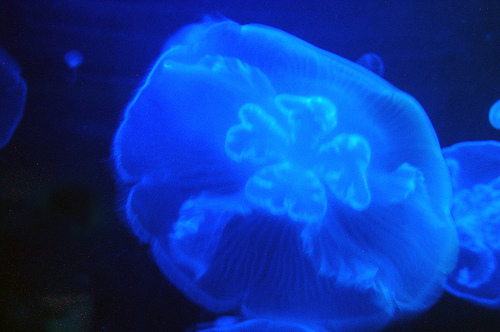 The box jellyfish prefer the warm waters, in contrast to other species. It’s important to note at this point that not all species of square or box jellyfish are fatal to human. This is reserved to only a few of these, with the C. fleckeri, being the most venomous among them. 5% acetic acid has proven an effective first aid but if you are stung by the Box, go immediately to the hospital for medical treatment. This entry was posted in 5% acetic acid/Vinegar on jelly stings, Box jellyfish, Cannonball jellyfish, crown jellyfish, florida-jellyfish-portuguese-man-of-war-florida-beaches-long-island-beaches-hawaii-waikki-oahu-guam-austalia-stingersmauve-jellyfis-pelagia-nortiluca-black-sea-nettles-stingrays-sport-fi, Irukandji, jellyfish, jellyfish species, jellyfish sting first aid, Jellyfish sting remedy, jellyfish stings, Jellyfish stings, vinegar, acetic acid, Lion's mane jellyfish, Man of War, marine sting first aids, marine stings, mushroom cap jellyfish, Pacifici coast sea nettles, Pelagia Nortiluca, Sand jellyfish, sea nettles, StingMate, Uncategorized, Vinegar on Jellyfish stings. Bookmark the permalink.